New ClaDun game revealed in Dengeki PlayStation. Nippon Ichi Software is developing ClaDun Sengoku for PS Vita, the latest issue of Dengeki PlayStation reveals. It will launch in Japan on May 26 for 5,184 yen at retail and 4,114 yen via download. First-print copies will include a “Real & Retro” soundtrack selection including the theme song and 60 minutes of background music from the game. The publisher recently launched a teaser website for the title. 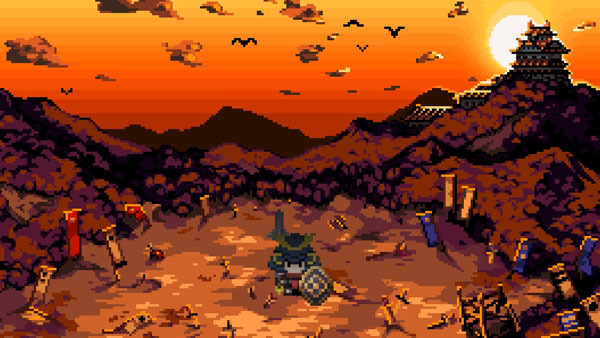 Directed by Yoshihiko Toda, ClaDun Sengoku is set during the Warring States period in the afterdeath world of “Arcanus Cella.” Players can make their own original character and weapons using a pixel-based creation element. The “Magic Circle” feature where you can strengthen your character by freely placing main and sub characters will also return. There will be competitive and cooperative multiplayer via ad-hoc play. There are seven jobs, including “Warrior,” “Aristocrat,” “Great Swordsman,” “Necromancer,” “Merchant,” “Sinful Priest,” and “Sorcerer.” There are eight weapon types, including the sword, blunt weapon, staff, spear, bow and arrow, short sword, shuriken, and sickle and chain.